Synthetic peptide within Human Versican aa 3200-3300 (Cysteine residue). The exact sequence is proprietary. WB: Fetal brain, fetal heart, rat and mouse hippocampal, mouse heart lysates; IHC-P: Human brain, Human bladder, mouse liver, Rat cerebrum tissues. Our Abpromise guarantee covers the use of ab177480 in the following tested applications. WB 1/1000 - 1/5000. Predicted molecular weight: 373 kDa. May play a role in intercellular signaling and in connecting cells with the extracellular matrix. May take part in the regulation of cell motility, growth and differentiation. Binds hyaluronic acid. Cerebral white matter and plasma. Isoform V0 and isoform V1 are expressed in normal brain, gliomas, medulloblastomas, schwannomas, neurofibromas, and meningiomas. Isoform V2 is restricted to normal brain and gliomas. Isoform V3 is found in all these tissues except medulloblastomas. Defects in VCAN are the cause of Wagner syndrome type 1 (WGN1) [MIM:143200]. WGN is a dominantly inherited vitreoretinopathy characterized by an optically empty vitreous cavity with fibrillary condensations and a preretinal avascular membrane. Other optical features include progressive chorioretinal atrophy, perivascular sheating, subcapsular cataract and myopia. Systemic manifestations are absent in WGN. Belongs to the aggrecan/versican proteoglycan family. Contains 1 Sushi (CCP/SCR) domain. Disappears after the cartilage development. 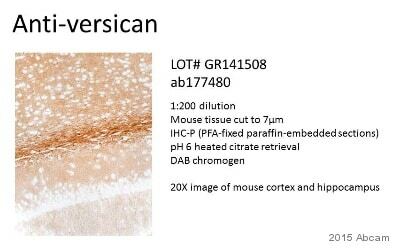 Immunohistochemistry (Formalin/PFA-fixed paraffin-embedded sections) analysis of Rat cerebrum tissue sections labeling Versican with Purified ab177480 at 1:100 dilution (1.09 µg/ml). Heat mediated antigen retrieval was performed using ab93684 (Tris/EDTA buffer, pH 9.0). ImmunoHistoProbe one step HRP Polymer (ready to use)was used as the secondary antibody.Negative control:PBS instead of the primary antibody.Hematoxylin was used as a counterstain. Immunohistochemistry (Formalin/PFA-fixed paraffin-embedded sections) analysis of Human bladder cancer tissue sections labeling Versican with Purified ab177480 at 1:100 dilution (1.09 µg/ml). Heat mediated antigen retrieval was performed using ab93684 (Tris/EDTA buffer, pH 9.0). ImmunoHistoProbe one step HRP Polymer (ready to use)was used as the secondary antibody.Negative control:PBS instead of the primary antibody.Hematoxylin was used as a counterstain. Immunohistochemistry (Formalin/PFA-fixed paraffin-embedded sections) analysis of Mouse liver tissue sections labeling Versican with Purified ab177480 at 1:100 dilution (1.09 µg/ml). Heat mediated antigen retrieval was performed using ab93684 (Tris/EDTA buffer, pH 9.0). ImmunoHistoProbe one step HRP Polymer (ready to use)was used as the secondary antibody.Negative control:PBS instead of the primary antibody.Hematoxylin was used as a counterstain. 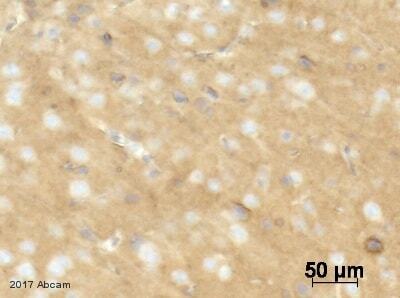 Immunohistochemical analysis of paraffin-embedded Human brain tissue labeling Versican with unpurified ab177480 at 1/50 dilution. Unpurified ab177480 staining Versican in mouse cortex and hippocampus tissue section by Immunohistochemistry (IHC-P - paraformaldehyde-fixed, paraffin-embedded sections). Tissue was fixed with paraformaldehyde, permeabilized with Triton X and blocked with 3% BSA for 1 hour at 20°C; antigen retrieval was by heat mediation in a citrate buffer. Samples were incubated with primary antibody (1/200 in PBS + 2% BSA + Triton X) for 18 hours at 4°C. A HRP-conjugated goat anti-mouse IgG polyclonal (1/500) was used as the secondary antibody. Publishing research using ab177480? Please let us know so that we can cite the reference in this datasheet.